Subordinate bearded dragons literally wave to other bearded dragons to say, "Hello, I'm here and I'm harmless." Subordinate females raise one of their front legs and wave it at a superior male or female bearded dragon as the other lizard approaches. This gesture, called circumduction, seems to initiate acceptance by the larger lizard. In the wild, baby great green iguanas spend the first 3 months of their lives feeding and sunning on the lower 30 feet of vegetation. Older iguanas sun above them. While they are at these lower levels, the younger iguanas consume greenery that has been inoculated, if you will, with the feces of the older iguanas in the upper story. During these months, the younger iguanas develop the same intestinal flora as the adults. The bacteria help break down the massive amounts of cellulose or plant fiber the young lizards consume throughout the rest of their lives. Baby iguanas kept in captivity (and not allowed to consume inoculated leaves) do not develop the intestinal flora and grow more slowly than their wild brethren. After 3 months, the now-larger-grown baby green iguanas move to higher perches in the vegetation. We put shoulder pads in our jackets, lifts in our shoes (or wear high heels) and wear "big hair." Lizards inflate themselves with air and stand high on their legs to look bigger and more imposing to other lizards and potential enemies. Sometimes lizards enhance their colors to look brighter and more distinct. But the amusing part of this tactic is that it only works if you look at the lizard from the side view. 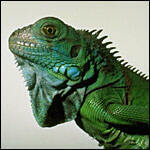 Two practitioners of the "look big" approach are the great green iguana and the arboreal chameleons. If you look at them from the back or head on when they are displaying, they look very thin (laterally compressed, in technical terms) but from the side they look too big to mess with. If you can't run away from an enemy, maybe you can disappear. One way depends on cryptic coloring, a quality displayed by fence swifts. They are obscurely patterned in gray and dark gray, and when they rest on the dark gray bark of the trees in their habitat, they disappear. Other lizards combine cryptic coloring with sudden movement and sudden stops. The western leaf lizard, Stenocercus fimbriatus, looks like a dead leaf, patterned in two shades of brown. It's a fast lizard, moving suddenly out of harm's way. But as you follow it with your eyes, it suddenly disappears and you cannot relocate it. The lizard has made a headlong dash away from you but has stopped less than 3 feet away. Hidden among the dead leaves on the forest floor, it is invisible as you search in vain 4 feet away. If you get too close, it may make another short dash, only to stop after moving just a few feet. Other lizards take the role-playing of playing opossum to heart. Corythrophanes cristata, the forest chameleon, is not a true chameleon. Its main claim to fame is not in its name but in its ability to seem very dead when you pick it up. What once was a shy but bright-eyed lizard, bearing an attractive crest on the back of its head, will turn into a rigid but lifeless lizard when you pick it up. Who wants to eat something that's obviously dead? The forest chameleon is hoping that all potential enemies will find its lifeless body unappealing. A few lizards take the "nothing ventured, nothing gained" stance when confronted with an enemy (defined as anything larger than they are, which is pretty much everything else in the world when you're only 9 inches long). These lizards will bite, and bite hard. One memorable example is the tokay gecko (named for its nocturnal call). The tokay gecko, originally from southeast Asia but now established in parts of Florida, is an aggressive feeder on insects, small mice, birds and lizards. It has tiny teeth but jaws strong enough to crush the skull of a mouse. Of particular interest is its bulldog tenacity in not only biting but in hanging on once it has something in its mouth. It tightens up at intervals, so you're reminded that there is a lizard biting the end of your finger, and it doesn't seem to be interested in letting go. By the time the tokay does let go, the end of your finger is numb. Other lizards are aggressive, but you rather expect that (and watch for it) from a 10-foot-long Komodo dragon. Aggression from a small lizard can be surprising. Even green iguanas can be aggressive toward their owners. This is particularly true of male iguanas and female keepers. A sexually mature male iguana may make an unprovoked attack on an unsuspecting female human, either because she has come too close to the lizard's personal space or because human odors may convey unknown messages to iguana chemoreceptors. Patti was surprised when our 5-foot-long male green iguana leapt down from his perch and charged her, when she entered his cage after a 2-week absence. He grabbed her pant leg. She shook him off and made an I'm-bigger-than-you-are display of her own, holding open the sides of her vest and stomping in a circle. She now knows to keep an eye on him when she enters the cage and to alert female "pet sitters" as well.